The City of the Selkirk is enhancing the unique character of Manitoba Avenue East. The Avenue (from Main Street to Eveline Street) will be reconstructed to include enhanced pedestrian and active transportation facilities, planters and additional street trees, seasonal patio locations, and two pocket parks complete with benches, public art, and activity space. In addition, one-way vehicle traffic will be converted to two-way vehicle traffic and angled parking will be changed to parallel parking. The reconstruction of Manitoba Avenue East will enhance the character of Manitoba Avenue, promote the area as a pedestrian and bicycle friendly destination, and improve the quality of public spaces along the street. The City formed a stakeholder advisory committee in 2012. From there, ideas were generated, a vision was born, and this new re-design is the product of the work that has been done since then. The City is now working with WSP, an engineering and planning firm, to enhance the unique character of Manitoba Avenue East and improve the pedestrian and cycling environment. Manitoba Avenue East has a small-town feel with pedestrian scaled commercial, office, residential, and institutional uses. Directing investment towards revitalizing Manitoba Avenue East can help establish Downtown Selkirk as a thriving pedestrian friendly destination. Throughout the reconstruction project, WSP will work with the City of Selkirk to refine the current design concept for Manitoba Avenue East, meet with local landowners, business owners, and community residents to seek feedback, and provide on-site management during reconstruction of Manitoba Avenue East. The reconstruction will take place June through October of 2019. In 2016, the City of Selkirk adopted The Downtown Selkirk Renewal Strategy (2016-2021) (The Strategy). 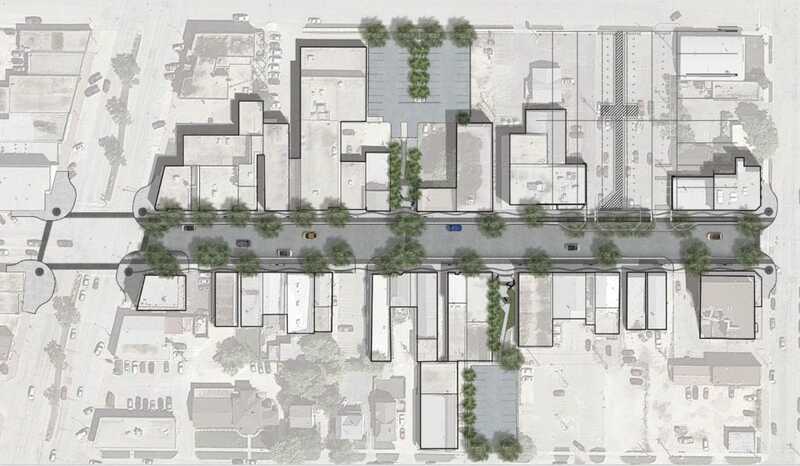 The Strategy provides a plan of action to help the City achieve its long-term vision for a vibrant downtown and includes the redevelopment of Manitoba Avenue East. In 2017, the City applied for and received funding from the Province of Manitoba and Government of Canada under the Building Canada Plan for the reconstruction of Manitoba Avenue East. City Council adopted the design plan in June of 2018. The funding received from the Building Canada Plan is being used to finalize the design and reconstruction of Manitoba Avenue East. A public open house was held on Thursday, April 4th at the Gordon Howard Centre. Residents, business owners and users of the area were in attendance to ask questions and provide feedback on the upcoming project. Project team members and City staff were available to answer questions and listen to feedback. If you would like to receive project updates, please subscribe to the City of Selkirk’s notification system (sign up on this page to the left) and you will be registered to receive periodic project updates by email. 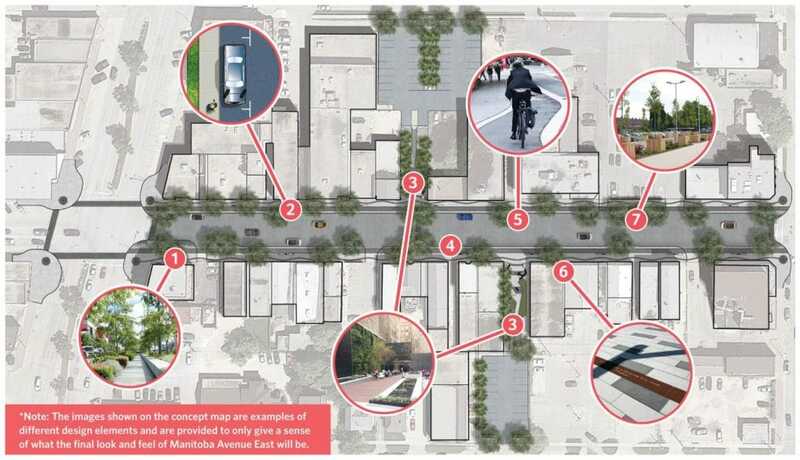 What is included in the design for Manitoba Avenue East? Converting angled parking to parallel parking. ﻿Why is Manitoba Avenue East converting from a one-way street to a two-way street? As a one-way street, Manitoba Avenue East directs traffic towards the Waterfront, limiting the connectivity potential with Main Street and Manitoba Avenue West. In addition, one-way traffic encourages higher traffic speeds, which negatively impacts the ability of the street to become a thriving pedestrian friendly destination street. To provide additional space for pedestrians and cyclists, existing angled parking on both sides of Manitoba Avenue East will be converted to parallel parking. There will be approximately 40 parallel parking spaces on Manitoba Avenue East. In addition, there are 241 parking spaces in six City owned off-street parking lots, all of which are within a two-minute walk or less to Manitoba Avenue East. The reconstruction of Manitoba Avenue East will be constructed from June through October 2019. Project updates and the option to subscribe to updates by email are on this page. Construction work on Manitoba Avenue East will be staged in phases to ensure that traffic flow and access to businesses on Manitoba Avenue East is maintained throughout the project. Access will be maintained for as much as possible for vehicles, pedestrians, parking, and events. There will be a one-day scheduled closure in October for the final road surface work to be completed. The project team will be meeting with business owners and landowners on Manitoba Avenue East to ensure that we understand how to best mitigate potential impacts to property use and/or business operations. The project team will be meeting with affected business owners and landowners on Manitoba Avenue East to understand how each business operates (i.e., parking and loading requirements, pedestrian access, hours of operations, etc. ), listen to any potential concerns, and answer questions. This information will help the project team better understand concerns regarding how construction may impact a business’s operations/property use and will assist with solutions to mitigate these impacts. If you are a business owner or landowner on Manitoba Avenue East please contact David Jopling, Public Engagement Lead at [email protected]. This project is a partnership project cost shared among the Province of Manitoba, Government of Canada and City of Selkirk under the Building Canada Plan. The design for Manitoba Avenue East will be posted here soon. Subscribe below to receive updates on infrastructure projects. If you haven't already, you can also subscribe to MySelkirk.ca notifications.